Have you ever bought a ticket to watch a comedy show in the hope of getting some fun and laughing away your worries only to get in and have to endure long, boring and even irritating “jokes”? Anyone who’s ever tried to go up on stage to make people laugh would respect the job of stand-up comedians. You have to be witty, charming and most importantly, you must be able to make people laugh at what you say and how you say it.. However, there are some stand-up-comedians who can’t make us laugh all the time or even struggle to make us smile. This sometimes causes them to be mocked or booed by the audience whether it’s because they’re known for repeating jokes or lack the versatility seen in veteran comedians. While comedians are paid to make us laugh, some are considered to do terrible at their craft by their fans, making them want to ask for a refund after a show. 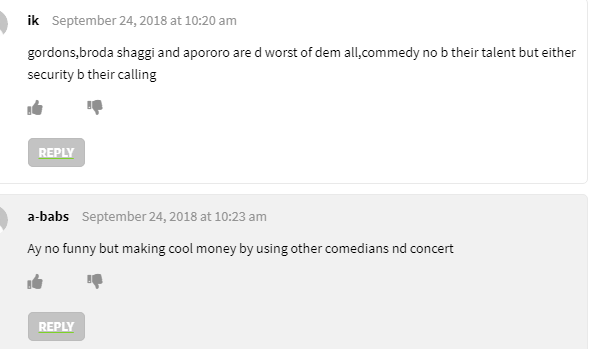 Although he is a successful comedian, some lovers of comedy find Akpororo annoying. It could be his voice, it could be his style of delivery, but whatever it is it’s enough to get him on this list. According to fans, his jokes are neither edgy nor funny. The jokes made are often very dull and boring and drag on and on. comedian Ayo Makun does great movies, but his comedy is getting worse by the day. Doesn’t mean he doesn’t make good stuff, his fans are just saying he isn’t actually funny. Broda Shaggi who is known for his Instagram skits also does stand up comedy. According to comedy lovers, he gives hope to comedians who want to be famous but have absolutely nothing funny to offer and he should try sticking to his skits which is better. Some of Gordons materials are actually quite funny. However, his accomplishments don’t prevent his jokes from being hated by many. Maybe it’s his annoying delivery of sophomoric material. Comedy is subjective so what you don’t find funny may be hilarious to the other person. People have different levels of comedy appreciation. So what do you think about these comedians.